Last summer Debbi mailed me a few beautiful bars of her homemade soap. One was a goats milk bar, and the other was hemp milk, and I loved them both. Smooth, creamy, and gentle. Sadly they are both gone now, so I set out to make something similar. I happened to have coconut milk on hand, so I thought that would be a good place to start. The resulting Gentle Coconut Milk Soap bars are white and creamy, gentle and unscented. I love them. Sadly the coconut milk scent doesn’t carry through, but coconut milk is still a lovely thing to have in soap. 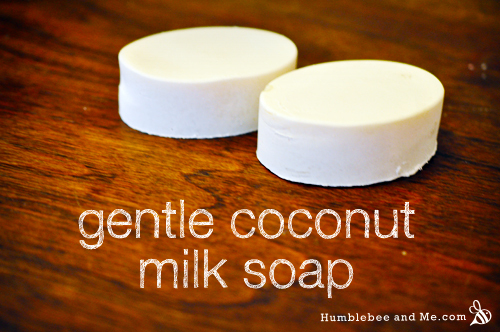 Coconut milk makes a gentle cleansing soap that’s rich in vitamin E oil and moisturizing. So, if you have sensitive skin (and if you’re sensitive to scents), this soap is a great choice. I think it’d be a great baby soap, but I don’t have a baby, so I’ll leave that up to the parents out there. Follow standard soap making procedure. I recommend letting the oils and fats come down to room temperature before combining as it gives you more time to work. At trace add the clay and dried coconut milk powder. 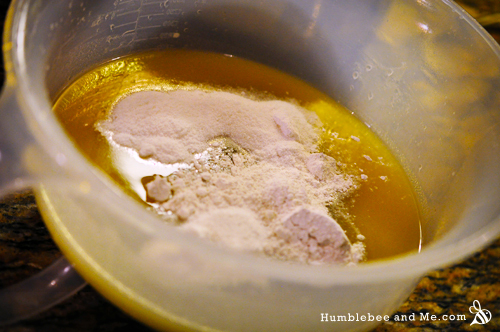 Use an immersion blender to thoroughly blend the powders into the soap (otherwise you will have little clumps). If you don’t have powdered coconut milk you can swap coconut milk for the water in this recipe. Start by freezing half a can of coconut milk in an ice cube tray the night before. When you measure out your liquids (by weight!) you should have half coconut milk ice cubes, half liquid coconut milk. Add your lye and stir, being extra sure to work in a well ventilated area and not inhale the fumes. You’ll notice the liquid thicken a little as the lye dissolves—that’s the fats in the coconut milk starting to saponify. No big deal. 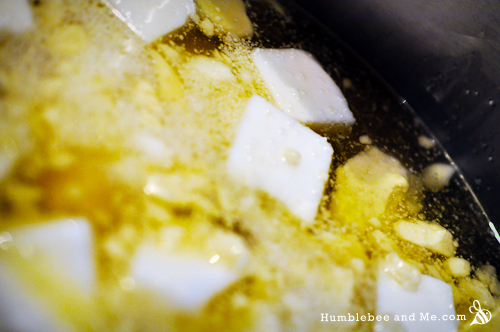 Let this mixture cool to the same temperature as the oils and go from there. This could literally not have come at a better time. Here I am finally plucking up the courage to start my very first soap batch today! I bought powdered coconut milk a few weeks ago to use it in place of water for my liquid, but I’ve since been having a tough time figuring out how I’d incorporate it. 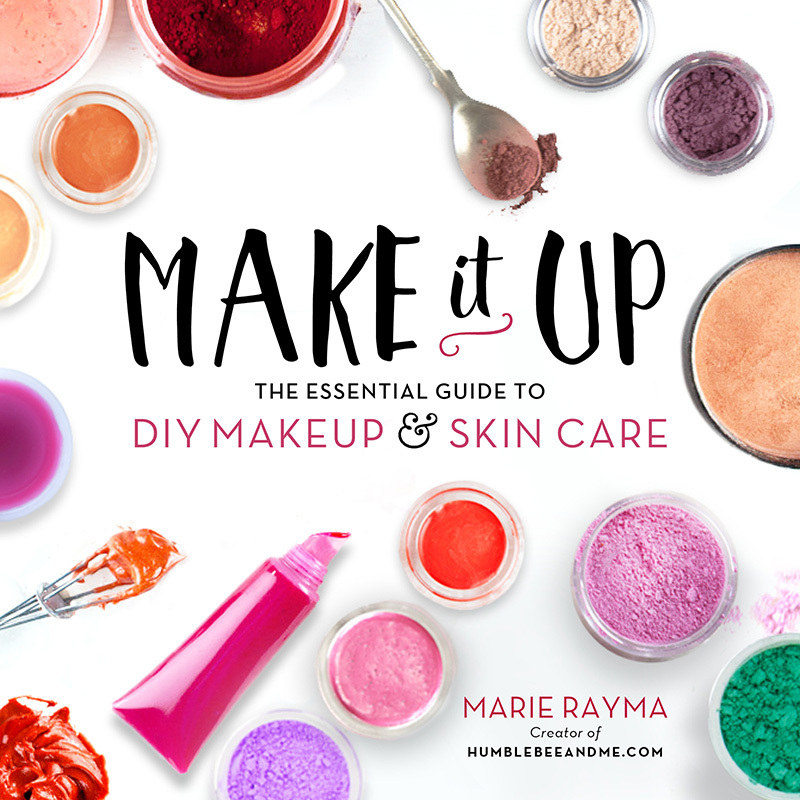 I’ve decided to try the room temperature method and for that I didn’t want to mix the powder with my lye solution – adding it at trace should work fabulously! Do you find it’s very creamy? I was thinking of going with a 6-7% superfat, but if the coconut milk contributes quite a bit of creaminess maybe I should cut it down to 5%? Hi Laura! Sorry for the delay in getting back to you—I’ve been swamped :/ Anyhow, I would not increase the superfat for this bar as it’s surprisingly soft at 5%, and more superfat will make it even softer. It’s also nice and gentle at 5%, so there’s really no need 🙂 And sorry if you’ve already made the soap… but if you have, how is it? 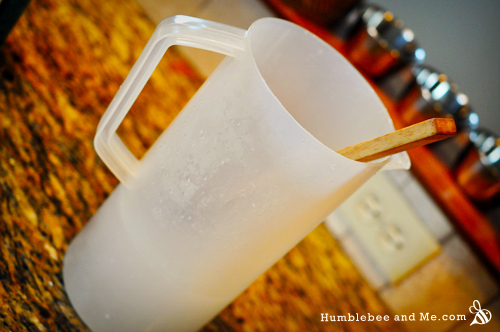 What do you have to do differently to make liquid soap. Prefer liquid to avoid the messy bars and then the messy bar rest. Love the idea of a gentle soap like this! Wonder if I could substitute Oat oil instead of the Soy bean oil? Or is it not as thick? Thank you again for sharing such awesome recipes! Thanks, LeAnn 🙂 Oat oil would be a lovely swap for the soy bean oil—let me know how it goes & thanks for reading! Using milk powder is a very easy way to get a similar result without worrying about curdling and fussing with frozen milk cubes 🙂 The results don’t seem to be identical, but it sure is a great workaround! I’m making soap this afternoon. I have coconut milk powder. This came at just the perfect time. Thank you. Are there different types of coconut milk powder that might behave differently? I just realized over the weekend that I have powdered coconut milk from Wilderness Naturals, but it has added ingredients (maltodextrin and casein). Would that work ok? I also have bunches of canned coconut milk but wondered if that might cause any problems with too much superfatting because of all of the fat in the coconut milk. I don’t know about casein, but maltodextrin might cause overheating and bad behaving volcano. I would prefer that canned coconut milk, I’m sure superfatting is no problem. You can use 50% water and 50% coconut milk, if you are worried about that fat amount. Thanks for chiming in with this great answer, Signe! Hi JenZ! I know Signe already gave you a great answer, I just thought I’d expand on it. The maltodextrin might be problematic because it is a polysaccharide comprised of glucose molecules, and sugar makes saponification run hotter, and sometimes too hot. Casein is a protein, so it shouldn’t effect the batch much. That said, the maltodextrin is probably present in pretty small amounts, and milk batches tend to run hotter as there is a bit of sugar in milk, so I doubt you’d notice much of a difference—I wouldn’t heavily insulate your mould, though. I just lay a towel over mine. Also, I have made soap with canned coconut milk and that works out really well, too. There’s generally not enough fat in it to throw the batch off, as long as you are using one of the lower fat milks (though light isn’t necessary). You’ll need to freeze half the coconut milk into cubes before you get started—I give an overview of that here. Should we freeze the canned coconut milk before adding the lye, to keep it from turning brown? 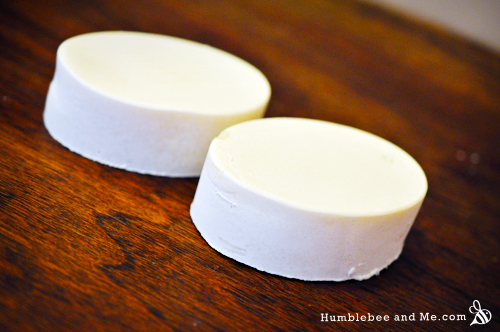 Since I used coconut milk powder here, I’d recommend checking out this recipe to see how I incorporated canned coconut milk into soap 🙂 Happy soaping! Just a quick note about casein. This is a major allergen and should be labeled as such, as it can cause chemical burns to a person with milk allergies. 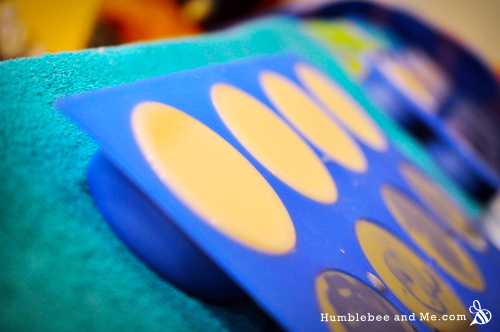 Quick question – where did you get your round mold that you used for this soap? I love it!! It’s from New Directions Aromatics—they just started carrying them a couple months ago. They’ve got some oval ones and other silicone moulds, and they are AWESOME! This soap looks good ,eh? 🙂 I have so many packets of coconut milk powder that I purchased at my local Asian market, now I have a great to use them! I noticed in this recipe that you are using soy bean oil for the first time. Is this a new NDA acquisition or are you beginning to transition to using Soy bean oil in your recipes? Also you may have answered this question already, but what does the stearic acid do in the soap? I have watched you all talk about making soap, I’m still afraid to do this. All these recipe. Is there an easy recipe & step by step & understandable terms.And what does what mean? Hi Margaret! I’ve written a detailed set of instructions on soap making here. You can also read more about lye and saponification here. I think those two articles should help you get well on your way 🙂 Have fun & be sure to comment with any questions you might have! I did this batch, but used my normal ingredients for soap and didnt change ANYTHING (castor, lard, shea butter, coconut oil, olive oil). The only thing was instead of the 190g that it called for water, I made that the coconut milk. I froze the milk until all of it was pretty much just slush….but I guess my question is what that alright? I ended up not using a full can because I reached the 190g before using all the slushy coconut milk. It seemed to turn out find, smell and look…however, it’s not pure white white like yours 🙁 Any thoughts? I mean does it sound like i did it right and it worked?? oy, normally I use powders…but the coconut milk was there, and I was there…LOL. I am new to soapmaking, and every time I find a new soap that sounds like something I’d like to make, I’m usually disappointed to find the recipe in cold or hit process format. My daughter and I only do melt and pour. This one sounds divine! Too bad it’s not M&P. Hi Deanna! I’m not sure how much you know about hot & cold processed soaps, so I really hope I’m not overstepping here. Melt and Pour soaps are like those tubes of cookie dough—all the important stuff has been done already, and now you just need to add the finishing touches, like icing, and baking (and extra chocolate, if you’re like me). And while that’s great for when you want cookies ASAP, you don’t have any control over what’s in them. Do you prefer whole grain flour or free range eggs? Too bad. Somebody else has already chosen all the ingredients, made up the recipe, measured everything out, and determined almost all the other variables. And while the cookies are going to taste awesome, they’ll never really be truly yours. So, to draw the analogy over to soap. Say you think palm oil is terrible for the environment, and you prefer tallow (as I do—here’s why). If your M&P base contains palm oil instead (as they invariably do), you’re out of luck. Too bad. Say you want to make shampoo or shaving soap, which requires 2–4x as much castor oil as usual so you can get a lovely, creamy abundance of lather? Out of luck again. Want to experiment with different bases, like milk, beer, coconut, or tea? No can do. I hope you can see why I prefer to make my soap from scratch—I like to control all the ingredients, not just the decorations. Looking for M&P recipes is like looking for recipes based on cake mixes—you’ll probably find most of the ambitious ones start from scratch, not from a box. In the canned CM variation, did you add the CM ice cubes with the liquid CM BEFORE mixing in the lye? Did this affect the colour of the soap? I used half liquid coconut milk, and half frozen, and mixed the cubes & milk together before slowly sprinkling in the lye. I just added a little at a time, stirring between additions, and the frozen cubes were all melted by the time all the lye was mixed in. As for colour, I can’t really comment as I’ve never made an identical batch of soap with liquid vs. powdered coconut milk as my only variable. Both produce a milky bar, one may just be a bit more opaque than the other. If you really want a white bar, I’d recommend adding a bit of titanium dioxide to the batch at trace (blend it in with your immersion blender). Hi Marie, I have finally made my first batch of soap, yeayyy. Waiting impatient to try it out! It sounds like you need to get cozy with a soap calculator—if I can use one, you can! No math required, I promise 🙂 Plus, you really do need to learn how to do the calculating yourself—you should never take somebody’s word on the amount of lye. Always, for your own safety, calculate or re-calculate every soap recipe you make. One of the other major benefits of the soap calc is that it gives you estimated final values for things like hardness and lather, as well as desired ranges (so a recipe might have a hardness of 40, with the desired range being 29—54, so you’d know your soap would be a sort of middle-of-the-road hardness). That way you can sort of test a batch before you make it. I think you’ll find the recipe you’re planning on making is going to be very soft. Try entering it into the calculator at different percentages and seeing how the numbers change depending on your tweaks 🙂 It’s a great way to learn how different fats behave in soap. Have you checked near the butter/margarine at your local grocery store? That’s where I always got my lard in Aus, just at Wooly’s. If I recall correctly it was in a red and silver foil, and was a lot nicer than the stuff I buy at the store here. I was looking for a coconut soap to try and this came up in my google search. I’ve just poured it into my moulds now and I can’t wait to try it!! I used coconut cream as a percentage of the liquid, tallow instead of lard, cocoa butter instead of shea, and rice bran oil instead of soy bean oil. Also added coconut cream fragrance oil and desiccated coconut for exfoliating. It smells like toasted coconut and it’s wonderful!! Hi Christina! It sounds like you’ll get a lovely hard, fragrant bar of coconutty goodness 😀 Thanks so much for reading and DIYIng with me! I am really addicted to your site. I made my own soap a month ago and it turned out divine. I want to get into the soap making business because there is no places to buy nice soap where I live. This soap looks sooooo good!!!! I’m going to try making it next week. The only problem I have with making a lot of the soaps on your blog is that you use a lot of shea butter and castor oil. I’m from Edmonton but I am now living in a small town in New Zealand and most oil is 3 times the price of oils back home. Shea butter costs a small fortune so I was wondering if I could replace the butter with more lard and the castor oil with rice bran oil (which is the cheapest oil in nz). Thanks for all the inspiration! Hi Monica! Thanks for reading & DIYing with me 🙂 I’d recommend running your new formula through SoapCalc and seeing how the hardness/lather/etc numbers do, and then trying it yourself 😉 It’s the best way to learn! Is fresh coconut milk okay to use instead of coconut powder? Maire, I am wondering if it would be possible to dissolve the lye in roughly half of the recommended water and allow that to cool down quite a bit and then add the coconut milk to that mixture to make up the water difference instead of freezing the coconut milk into cubes. I have never made a milk soap but I would like to try this one without all of the fussing but still using some of my canned milk. It’s worth a try! You could probably also try ice cubes + liquid coconut milk. Hi Marie, am planning to make this wonderful recipe soon but I have a question please, a soap with Kaolin clay is good for sensitive and dry skin? I have found them to be, yes, but that will obviously vary by person. Hi Marie. Happy new year to you, well, almost. Can I use tallow, (beef), in place of the lard interchangeably? My sister raises beef cattle so I have a steady supply. Thanks in advance for your reply. Hey Verica! You definitely can—I often do 🙂 Just be sure to calculate the recipe accordingly! I did so and thank you! This past week I also had the luck to learn the difference between leaf and muscle fat….boy oh boy is rendered leaf fat the silkiest, most emollient fat I have ever encountered. So much that I am eyeing it for lotions or balms, vs saponifying it. It’s that good. Thanks again Marie! I don’t know you, but I love what you share and teach!!!! After reading this I got a bit curious, and was thinking maybe I could use oat milk like in your lotion, and add a teaspoon of honey in when the soap reached a light trace, would this work? Thanks for posting this recipe! It looks so creamy and white. I want to try it this weekend. 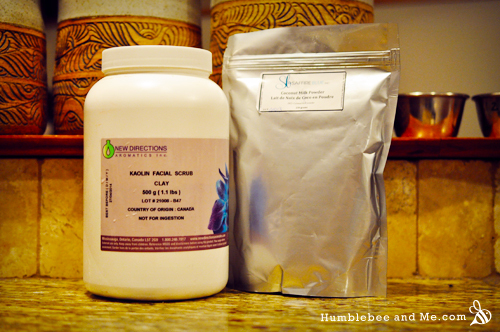 Could I add another Tbs of coconut milk powder if I don’t have kaolin clay powder? Where do you get the labels you use on your projects?